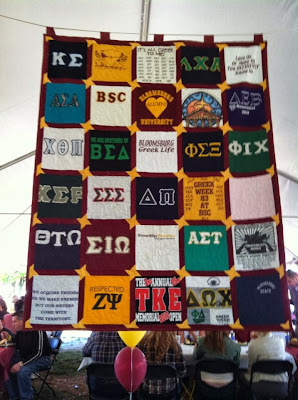 Hanging a Memory Quilt can be tricky. 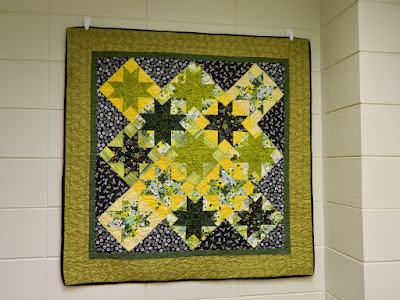 First, it must be decided if the quilt will be hung temporarily or permanently. Once this decision is made the following methods have worked well for MQBM customers. 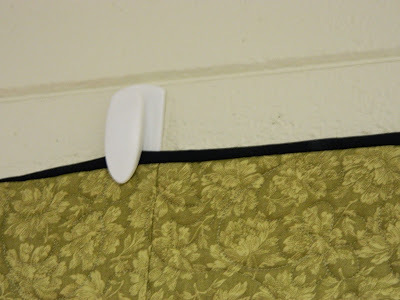 If you wanted to hang a quilt on a cinder block wall, say in a dorm room, Command Strips with a Spring clip work well. They are not for sale at all the stores with Command Strips, but they are out there. The directions were very easy and helpful. Peel off the red side. Stick onto the plastic strip. Then, peel off black side. After peeling off black side, attach it to the wall. Once it is firmly on the wall, slide the clip part up and off as shown on directions. 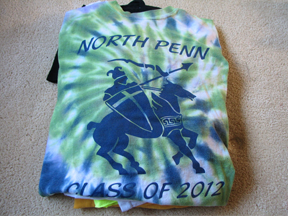 It will look like this (below). Rub these for about 30 seconds to make sure they stick. Wait one hour. Then, slide the clip back on. 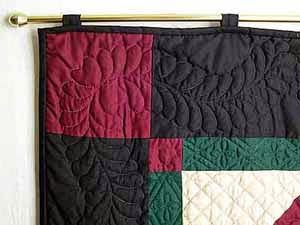 Please remember, the larger the quilt the more clips you will need. This is critical! Pant hangers with the hooks that swivel will give you more hanging flexibility. 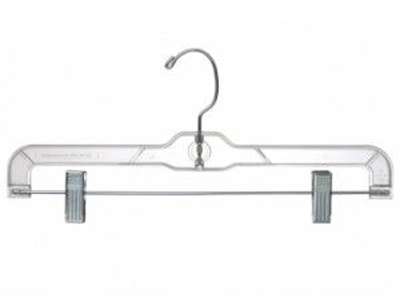 You can hang the hangers from a bar stretched between two ladders, from gutters, from a rope tied between two trees or any other way you can come up with! Please remember, the larger the quilt the more hangers you will need. This is critical! 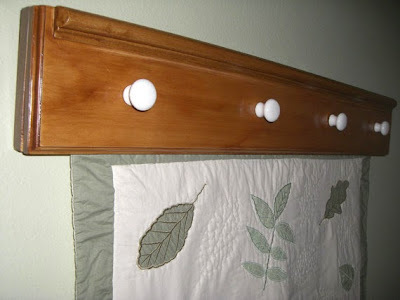 A traditional way to hang a quilt is by using any decorative curtain rod. 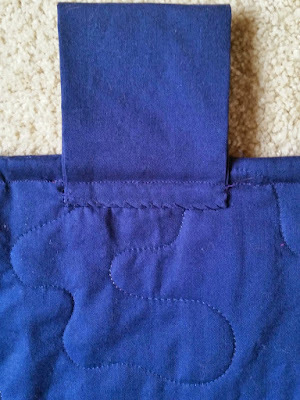 Thee rod is run through fabric tabs or a fabric sleeve that is made and sewn to the quilt. 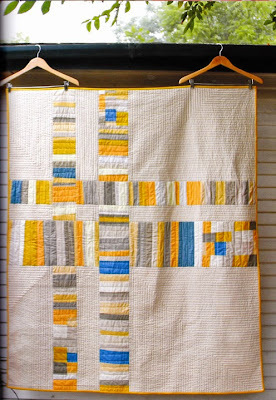 Memory Quilts by Molly will add tabs to your quilt just like the ones shown here. These tabs are sewn 12 inches apart a the top of the quilt. The rod of your choosing is then fed through the tabs. This is a traditional way to hang a quilt. 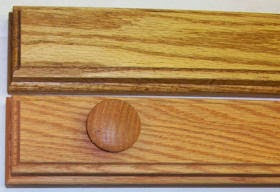 Any type of curtain rod can be used. 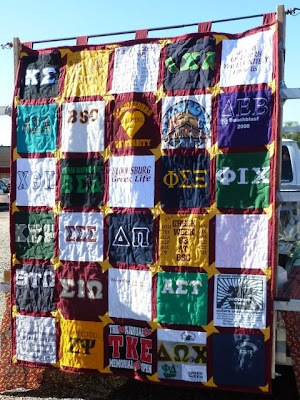 This quilt was hung with tabs, a curtain rod AND a wooden structure that was built on the back of a truck in order to include the quilt in a parade. These are custom made quilt hangers that can be custom made or purchased specially for your quilt and its dimensions.